THE BAADER-MEINHOF COMPLEX, a German historical pastiche of the real-life 1970s terrorist group Red Army Faction that was nominated for both the Oscar and the Golden Globe, was slated to go directly to dvd release into the United States. That one of the most celebrated European films of the year would have such a fate is testament to the challenge that arthouse films, particularly those with sub-titles, are facing in this economic market. However, like a knight on a white horse, a new American art house distributor has galloped to the rescue to offer film audiences a chance to discover the film on the big screen. Vitagraph Films (www.vitagraphfilms.com), which is currently distributing the diverting documentary VALENTINO THE LAST EMPEROR, has secured North American rights for the film from German production company Constantin Films. 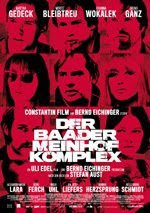 BAADER-MEINHOF was written and produced by German honco Bernd Eichinger and directed by Uli Edel, who helmed one of Germany’s best-known films of the 1980s, CHRISTIANE F.